Additionally, Right Relevance provides an Insights offering that combines the above Topics and Influencers information with real time conversations to provide actionable intelligence with visualizations to enable decision making. The Insights service is applicable to emerging events like elections, conferences, product launches, breaking news developments, outbreaks like Ebola etc. 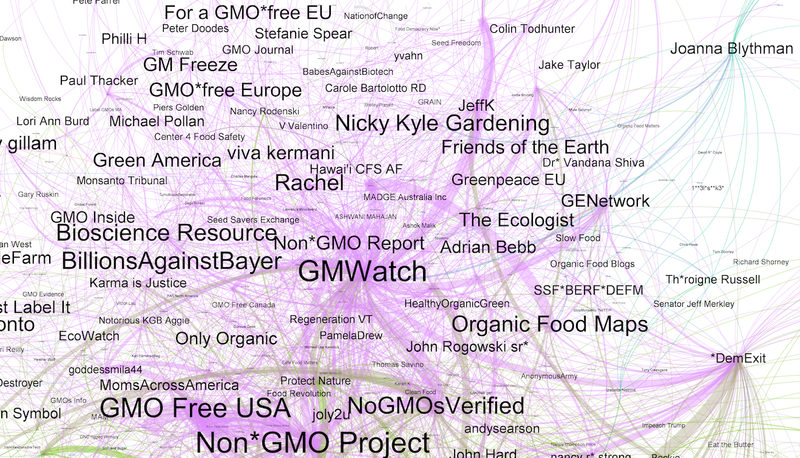 This report is a summary of graph analysis of engagements and conversations including retweets, mentions and replies of tweets from January 2017 on terms related to GMOs. The report leverages tweets sampled from Jan 1st to Jan 31st 2017 and along with Right Relevance topics, topical communities’ and articles data form the basis for the analysis. The communities’ graph (Fig 1) for GMOs, similar to our US election analysis graph, shows a strongly partisan split into pro-GMO (green) and anti-GMO (pink) supporters. This is probably not unexpected. The retweets-only graph (Fig 2) is even more stark in bringing out the partisanship. It visualizes the echo-chamber like nature of the partisan groups. Also, it shows higher diversity and broader participation on the anti-GMO side. We’ll dive deeper into the sub-communities and the leading users driving each sub-community in the Flocks section. The communities, users and tweets related to the top themes will be outlined and discussed in greater details below as we delve deeper. The top three tweets in this timeframe are as show below in Fig 4. 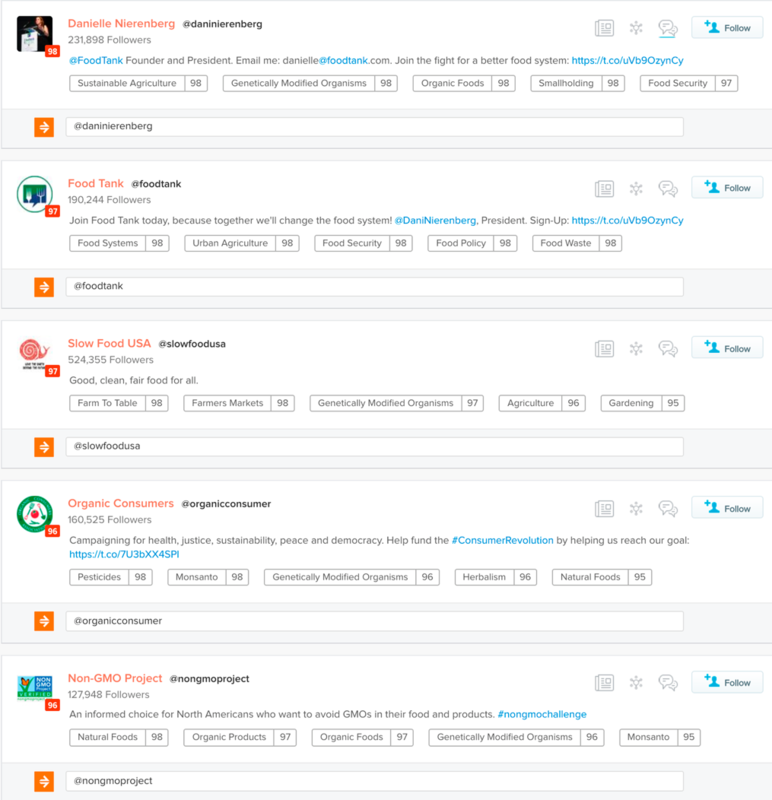 Though the top themes seem overwhelmingly anti-GMO, the top 3 tweets during this timeframe are pro-GMO. As we’ll see below, this is a potential sign of echo chambers coming into action. Measuring influence is not deterministic. It’s a subjective task with numerous different methodologies and is generally ephemeral in nature. ‘engagement influence’ by measuring quality and quantity of engagements (RTs, mentions, replies), reach of tweets etc. within the context of an event or trend. Right Relevance algorithmically mines social media at scale to produce a measure of influence per topic termed as ‘topical influencers’ or Tribes. Unstructured text, network analysis, social signals along with semantic data, ML, NLP are leveraged to produce two sets of information; a set of ‘structured topics’ (~50K) with semantic information and; a connected graph of scored ranked influencers for each of these structured topics we call ‘topical influencers’ or Tribes. For e.g. ‘genetically modified organisms’ is a structured topic in the Right Relevance platform with the following metadata (Fig 5) returned by the RR Topics Metadata API of the RR API offering. The top related topics include veganism, vegetarian diet, healthy eating, gluten free diet, nutrition among others. 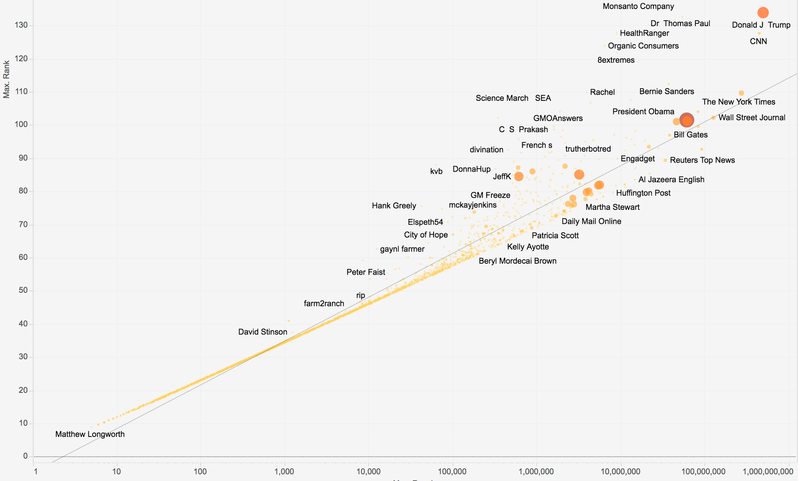 Right Relevance also identified ~4K scored ranked set of GMO influencers on Right Relevance. The top 5 are listed in Fig 6 below. 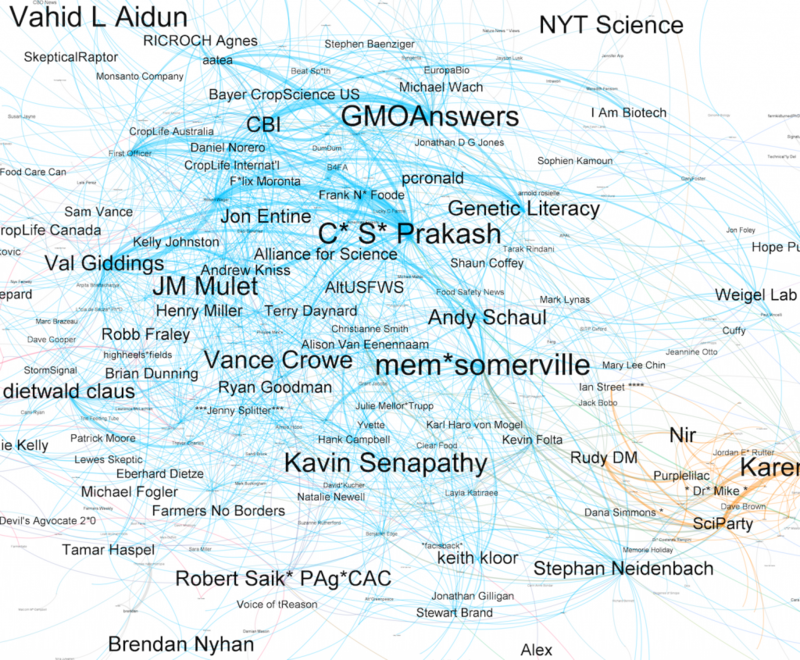 Fig 7 provides a connected graph view of the top 30 influencers for ‘GMOs. The graph view is available via the Right Relevance Enterprise dashboard. We apply several methods including PageRank and Betweeness centrality to measure the quality and quantity of engagements (RTs, mentions, replies), reach of tweets, connections etc. within the context of an event or trend. This leads to a measure of Influence based on engagements, which is temporal in nature. We call the communities detected in this manner as Flocks considering the temporal contextual aka flocking nature of the behavior. The several ways of ranking within this methodology are documented at Twitter Conversation Performance Measures. The first two lists (Fig 8) are of the top 30 accounts by Overall & PageRank measures. Overall rank is a normalized rank to reduce the skew towards users with large numbers of followers or a single tweet having a large number of engagements/RTs (often referred to as becoming ‘viral’). Both measures bring out @NonGMOProject, @GMWatch, @FarmFairyCrafts, @MonsantoCo, @realDonaldTrump, @DrThomasPaul, @HealthRanger as the top accounts. 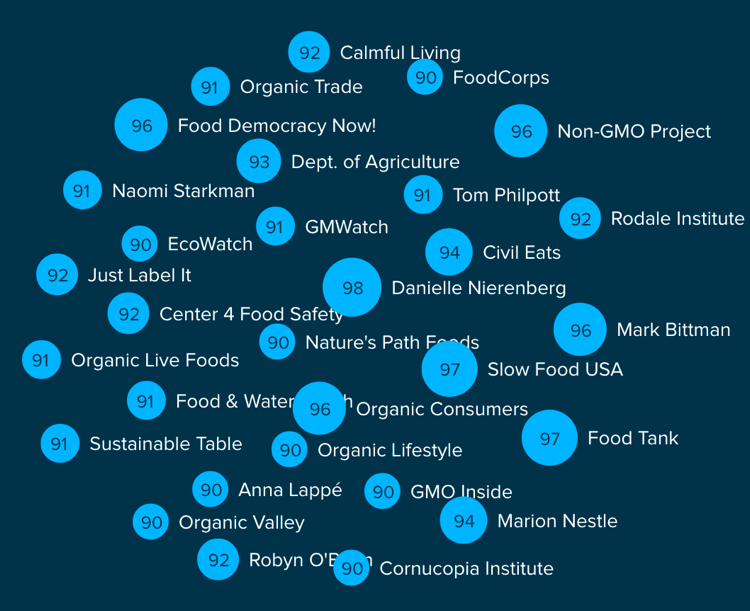 @RachelsNews, @saul42 and @kevinfolta are the main users bubbled up by the top overall measure. @realDonaldTrump and @CNN don’t have much to do with GMOs per se but still have a high rank due to the virality of a 1 or 2 tweets and/or high followers count. The high ranking of these accounts clearly show the susceptibility of PageRank to high followers count or high reach (RT etc.) of one tweet. Donald Trump’s presence is explained by the inauguration falling during this timeframe along with the extremely high reach (followers) of this account. CNN’s popularity is both due to the extremely high reach along with the virality of the tweet in Fig 9. The top overall measure, in spite to the normalized nature, didn’t bring up many new users to the top. This is possibly another clue of the echo chamber nature of the conversations and top heaviness of the total users involved. Connectors list is based on Betweeness centrality, which is a measure of the degree to which a node forms a bridge or critical link between all other users. We use this as a measure of influence wrt value in being information and/or communication hubs. The first thing to notice is how this list is very different compared to PageRank and Overall measures. Most of the well-known high followers count unrelated accounts like Donald Trump and CNN are absent. All the top accounts like @GMWatch, @RachelsNews, @FarmFairyCrafts, @NonGMOProject, @kimberlymontse1 are anti-GMOs and seem like big hubs of information dissemination for that. The value of this measure lies in that it bubbles up accounts with influence in terms of news and information dissemination in this subject. Another view to understand influence is to plot reach (followers) against a normalized measure we call rank. This is another great way to dampen pure follower based metrics and to bring out users that hold more sway within the community itself. We had to trim @GMWatch, @FarmFairyCrafts and @NonGMOProject since they were off the charts wrt both reach (audience/voice) but especially rank (authority) to enable us to show the other users more clearly. High followers count accounts like The New York Times, Wall Street Journal, Bill Gates, Reuters Top News, President Obama, Bernie Sanders, Engadnet, Aj Jazeeram Huffington Post, CNN, Donald Trump etc. have extremely high Reach (audience) as expected but are either below or very close to the line diving Reach from Rank. Their influence in the GMOs space is marginal at best but when they do speak they get a substantial audience as expected. 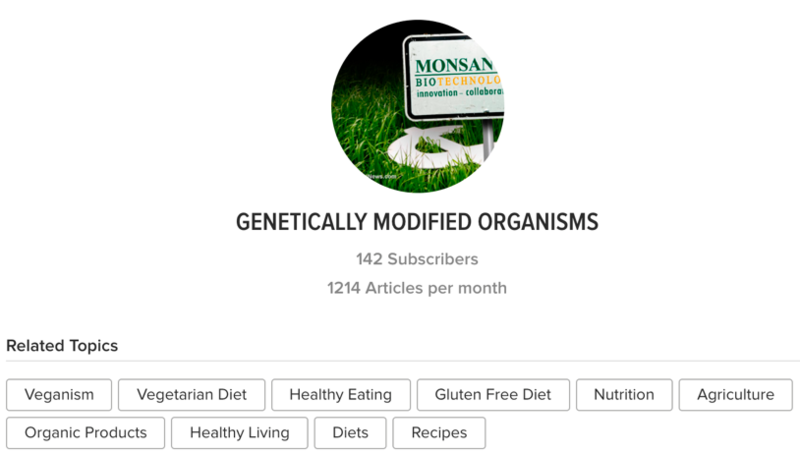 Activists, Bloggers and GMO-related user accounts like GMWatch, Non GMO Project, Farm Fairy Crafts, Monsanto, Dr. Thomas Paul, HealthRanger, 8extremes, Rachel, Seattle March SEA etc., have much higher Rank. 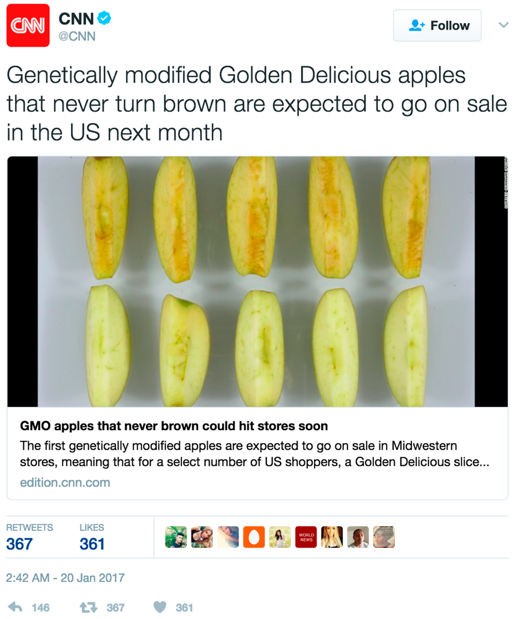 They’ve managed to gain a lot of traction in GMOs subject even with relatively far lower Reach (in terms of followers). This is probably because they are early movers and/or tightly integrated in this subject’s community. Flocks are people engaging in conversations around events esp. in context of a specific subject, which is ‘GMOs’ and related terms in this case. This “flocking” can lead to building of temporal communities with local influence that can lead to virality not obvious by the standalone influence of the individuals or without the context of the event. One interesting fact is that engagement with Monsanto of anti-GMO is so high, it has been pulled into the anti-GMO side of the mentions graph. Several viable flocks came up via graph analysis and visible in the Gephi graph. We’ll outline 4 primary ones. Please email biz@rightrelevance.com for access to more in-depth analysis. The flock names below are named on the user/account with most PageRank in the flock. The 1st flock, tagged ‘FarmFairyCrafts’, forms an active community with primary focus on organic food, boycotting GMOs and Monsanto, labeling GMO products as seen by the trending terms in Fig 12. The main push seems to be boycotting GMO products and promoting healthy and sustainable living including eating healthy, organic and non-GMO foods. 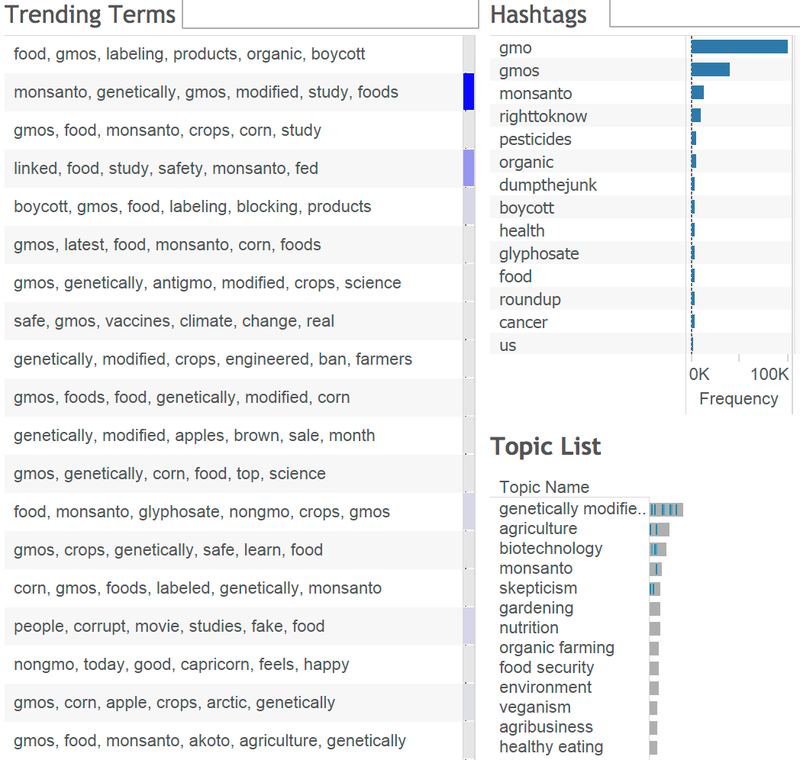 Related hashtags (#righttoknow, #monsanto, #boycott, #organic) and topics (GMOs, Monsanto, veganism, gardening, nutrition, sustainable living, agriculture, healthy living, healthy eating etc.) (Figure 12) doubly confirm the focus of conversations for this community. The top users for this flock have a healthy overlap with the top users as found by betweenness centrality (connectors) & Reach Vs Rank measures. This view provides more context around the areas of their influence and the topics of conversations they engage in. Fig 14 is a snapshot of the ‘FarmFairyCrafts’ flock sub-graph. ‘GMWatch’ is another non/anti-GMOs flock with primary focus on Monsanto, studying GMOs effect, food safety along with a fairly big overlap with the ‘FarmFairyCrafts’ focused on organic and healthy non-GMO food. This seems like a more science, education and environmental activism heavy flock opposing GMOs. The set of related hashtags are mostly same as the ‘FarmFairyCrafts’ flock above. The Right Relevance related topics have some distinct topics like ecology, permaculture, environment, environmentalism, food security etc. that show the slightly different focus though food and health remain a major theme. 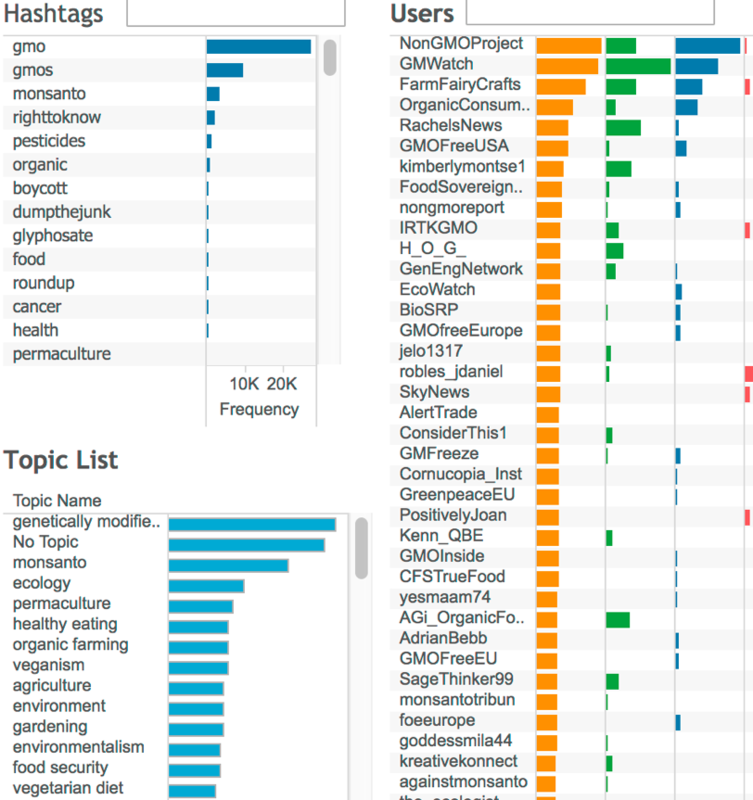 The users also have a big overlap with ‘farmFairyCrafts’ but top users like Non-GMO Project, GMWatch, GMO Free USA are more anti-GMO activism, education and science information based accounts. Figure 17 is the Gephi graph snapshot of the ‘GMWatch’ flock sub-graph. Top user ‘Science March – SEA’ is an account to promote a pro science march in Seattle on April 22nd. Other top users like Kevin Folta, C. S. Prakash, Genetic Literacy, JM Mulet, Val Giddings, Keith Kloor, Stephan Neidenbach, Kavin Senapathy, Council for Biotechnology Information and mem_somerville are scientists, academics, educational sites, journalists, corporates in the biotechnology, genomics, agriculture science etc. areas with expertise in GMOs. Looking at the graph snapshot in Fig 20, the engagements seem concentrated mostly within the flock with light interactions outside the related sub-communities. This is a sign of an echo chamber whereby the pro-GMO message is not reaching beyond the existing pro-GMO community. We’ll leave the analysis of this flock to the readers with the following graph snapshot in Fig 21 as a clue. 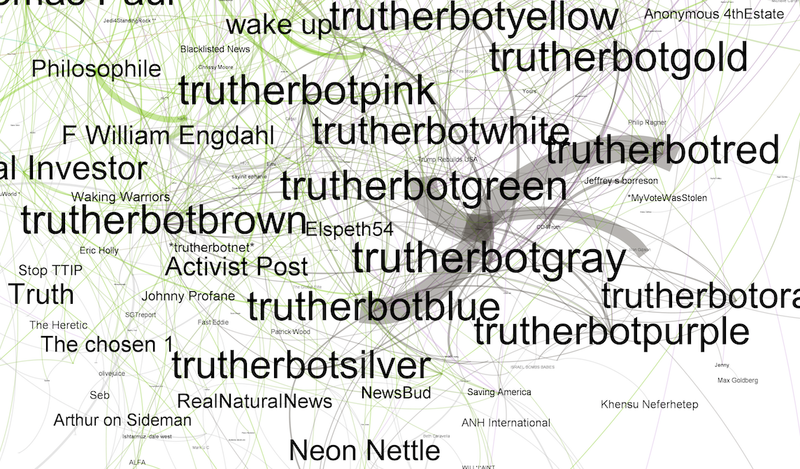 The ‘trutherbotgray‘ flock, basically a series of anti-GMO bot accounts, has its own echo chamber with a vast majority of engagements within members of the flock. It does not have any real penetration in the overall GMOs conversations as observed from the complete graphs in Figure 1 and 2. Twitter is a source of vibrant GMOs (and related terms) conversations with extremely well defined communities, influential users and critical discussions. Easily identifiable and deeply partisan pro-GMO and anti-GMO communities with each having its own echo chamber. 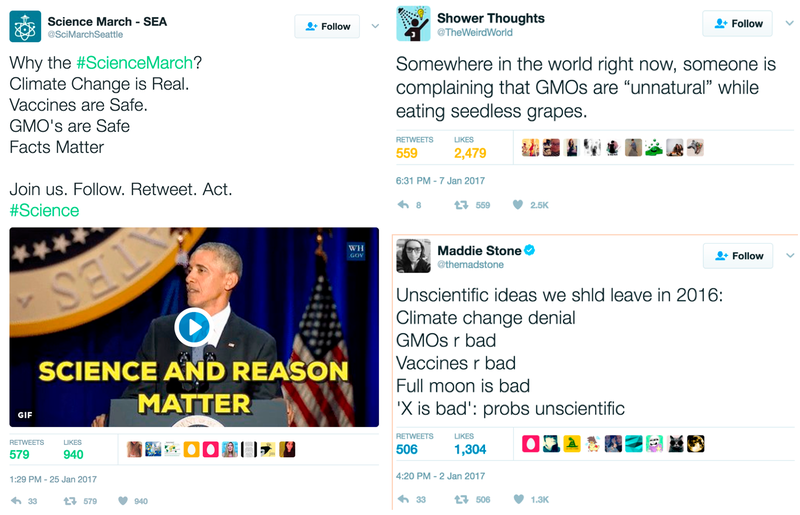 Anti -GMO communities seem to be winning the information war on Twitter. 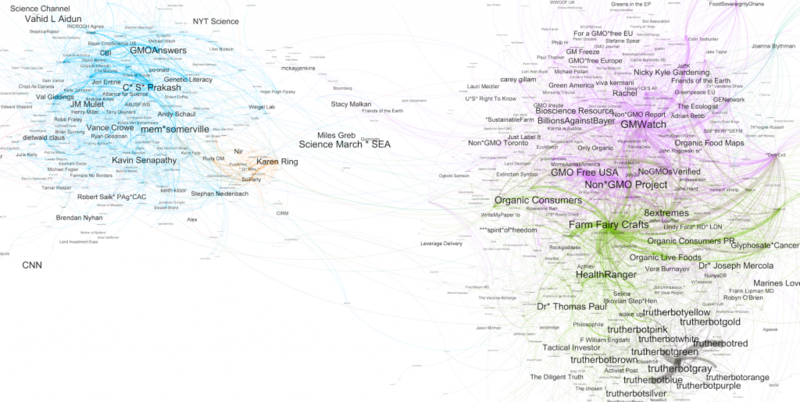 Anti-GMO communities seem to have greater diversity along with broader reach. Both communities seem top heavy with a select set of users driving the conversations. This along with the echo chambers formed needs more analysis. Please contact biz@rightrelevance.com for more details.